The traditional Christmas dinner is formal and festive. Holiday meals are often the most elaborate, formal meals of the year. Deciding what to serve for Christmas dinner can be a challenge when planning a menu for family members and friends who may have different dietary needs and preferences. Fortunately, Christmas dinner menus can be highly varied, and this is a great time of year to experiment with new and unusual dishes that can make the holiday meal more memorable. The most familiar Christmas dinner for many families is heavily influenced by the spread of Christianity through colonization. This means that Christmas dinner menus in the United Kingdom, United States, Canada and countries that share colonial ties are similar. Every family will have variations, however, and there is no one "correct" choice for what to serve for Christmas dinner. Click on links in the lists below for recipes. The choice of a specific meat will vary by region and other factors, such as individual tastes and food budgets, and there can be many different ways to prepare each meat. Vegetarian families may opt for a tofu main dish instead, or a hearty vegetable casserole that will serve as the entrée. When planning Christmas dinner, opt for three or four side dishes that can appeal to a range of tastes. In general, one type of potato or starch, a bread, and one or two vegetables help complete the main meal. When choosing special holiday drinks, be sure to include both alcoholic and non-alcoholic options for guests to enjoy. Family heirloom recipes are often popular choices for Christmas desserts, and many families will only make those recipes during the holiday season. Families that have blended cultures in their heritage often include unique ethnic foods as part of a Christmas dinner menu. This can be a great way to introduce guests to different cultures and to honor one's heritage at this very special time of year. Many ethnic recipes often include the same foods as are common in an American Christmas dinner, but the preparation methods may vary significantly. 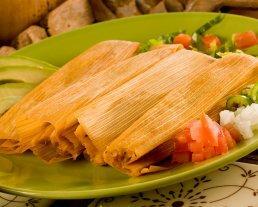 Tamales are a holiday treat in Mexico. Deciding what to serve for Christmas dinner to honor one's cultural heritage is more complicated than simply learning what ethnic foods are popular in different countries, however. To best honor your culture, consult with older relatives about what foods they remember from the holidays. Do your best to recreate those classic dishes to introduce them to a new generation. Don't be afraid to experiment with recipes or try new dishes, but if the cooking methods are unfamiliar, try a sample dish a few days before the big meal and make adjustments as necessary. If preparing a wide variety of dishes is beyond your culinary skill or the time in your holiday schedule, consider a potluck meal and invite guests to bring their favorite dishes. For a unique menu, consider trying a central theme - such as honoring one culture or including the same ingredient in every dish. Take the time to honor new family members, such as newlyweds, by including their favorite dishes in the holiday menu. Be aware of different guests' dietary needs, such as allergies or medical conditions that may have diet restrictions, and be sure there are plenty of dishes they can enjoy. Plan at least 90 minutes for eating the meal you've so carefully prepared, so everyone can take the time to savor different dishes and enjoy the conversation and company of the holidays. 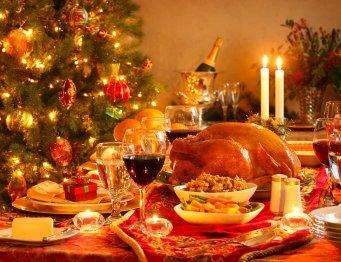 Choosing what to serve for Christmas dinner can seem daunting, but holiday menus have a lot of flexibility. Opting for unique dishes is a great way to create a memorable Christmas meal that can honor everyone eating it.